Whilst many of our favourite plants shout for our attention throughout the year some sit quietly in our gardens for most of the year with an air of modesty. They block unsightly views, they fill corners, they provide evergreen background to more colourful cousins, they can filter out noise and all without demanding much in return….until their one subtle moment of glory. 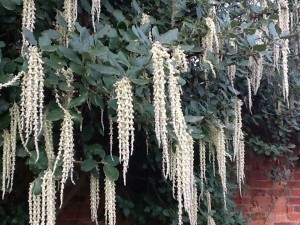 Garrya Elliptica is one such ; given its head and allowed to grow to its full size it can be magnificent in the cold days of late winter. To often it isn’t allowed to stretch its limbs to a graceful rounded large shrub and is hacked back rather than sympathetically pruned. Left alone though the flower display is stunning. Philip Read, plant area manager at Podington Garden centre is a fan though and describes the ‘Silk tassel bush’ as arguably one of the finest winter garden plants. A mature shrub has a real presence in the garden at this time of year and is wonderful to see with its catkins dripping from every branch. If you can find the room in your garden it is well worth the space for the unexpected pleasure it gives in these cold days. For more advice please contact either Eden Landscape Projects or Podington Garden centre.